Direct Application Ear Training Harmonic Major Modes include all 7 modes in all 12 keys. This gives you a good amount of MP3s so that you won’t memorize the order of the ear training exercises. It also gives you a chance to work on these modes in all keys which is great for a comprehensive understanding of each mode. 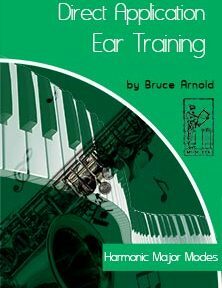 Why Work on Harmonic Major Mode Ear Training? Harmonic Major Modes are used way more than most people realize. As static vamps they are often employed. Especially the Harmonic Major and Mixolydian b2 modes. Harmonic Major Modes are also used extensively as Secondary Dominants. Take a tune like “Someday My Prince Will Come.” It has two modes of the Harmonic Major scale used within the 1st four chords. These course is of particular importance because many students have problem hearing more complication key center so studying the Harmonic Major mode gives them a chance to hone their ability with more elusive key centers. This Ear Training Harmonic Major Modes course goes through all 12 keys for scale. This makes it an excellent study especially if you are an improviser. You play along with the track as you learn to improvise on these modes. All tracks use a funk feel so they are really fun to play over. Help your 16th note playing, your ear training skills and you instrumental technique all at the same time with this course. Why Learn the Harmonic Major Modes. Does Anybody use Them? The answer is yes these modes are used a lot. As just static vamps you will often hear vamps either using the modes of Harmonic Major or the Harmonic Major Modes could be used as a superimposition. In many cases the Harmonic Major modes are used over common Secondary Dominant chords. Depending on how you hear those chords you would either think of the scale from the root of the chord or from the root of the key center. What makes Direct Application Harmonic Major Modes Course Special? Students usually need a lot of work with 16th note grooves and this collection is jam packed with these type of grooves. This is a fun way to do ear training and much like what you would experience in a real live situation. Take a listen to some of the tracks below to get an idea of the kind of feels that are employed. Here are some short examples of the 7 modes. Remember each of these Direct Application Tracks can be found in all 12 keys in this course. 82 MP3s total. Jam Tracks for 7 modes of Harmonic Major in 12 keys. This course and the related Jam Tracks Volume Four have made me realize the important the modes of Harmonic Major. Thanks for putting together such a comprehensive package T. Andersen.